I have always had this idea in my head of what Italy would be like. Siena fit the bill. It conformed to my imagination perfectly! 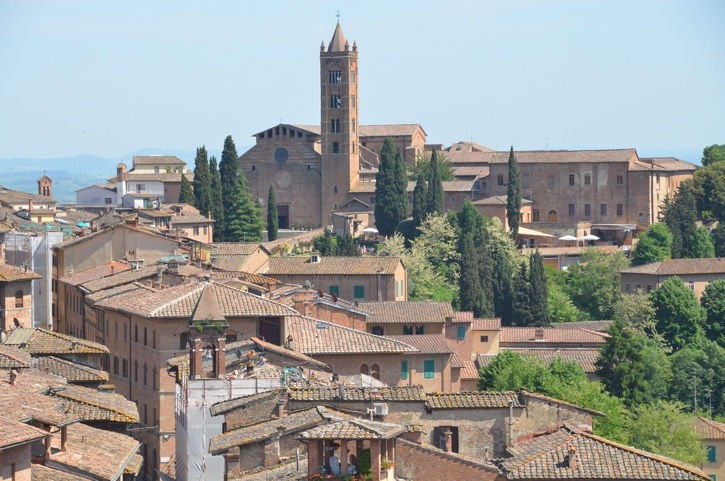 This medieval town is typified by tall buildings, narrow walkways, lovely churches, and a picturesque piazza. Like the other medieval towns, it is on the top of a mountain and surrounded by a large city wall. 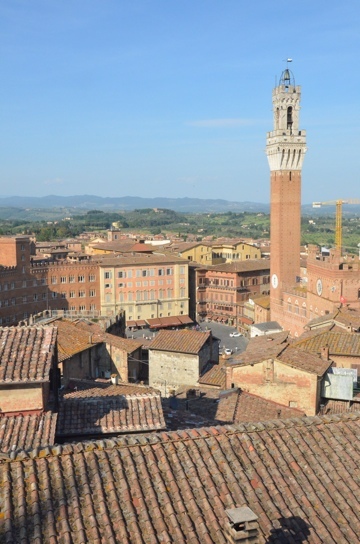 In the middle ages, Siena was an important, thriving city. Sadly, the black plague in the 1300s reduced it’s population from 100,000 to 30,000. It became a bit of a ghost town, and because of this tragedy, never fully regained it’s status. It was even ignored during the war years of the 20th century. Consequently, it is extraordinarily well preserved. To get into the city, we parked down below and then hiked up a small hill to a series of escalators that got us into the city itself. We we’re so glad for that modern convenience! Hiking that would be quite a chore. The first thing we did was to make our way to Il Campo, the main plaza. There’s is something magical about this piazza. It is very large, and surrounded by tall, unique palazzi as well as a bell tower. 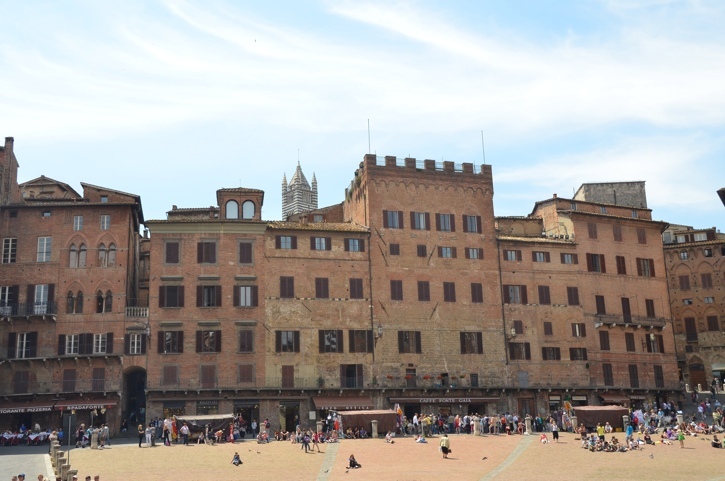 Standing in the piazza, completely surrounded by tall buildings of such ancient heritage, I felt a bit like I was transported to another time. There were no cars, and nothing was visible to indicate that we were still a part of the 21st century. 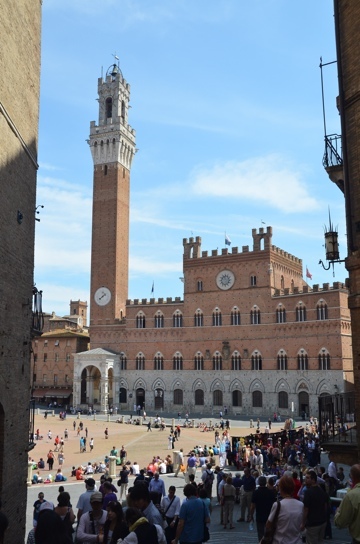 Our first visit was a building right on the Campo, the Palazzo Publico. This building was used as the city hall since the Middle Ages, and has since been turned into a museum. 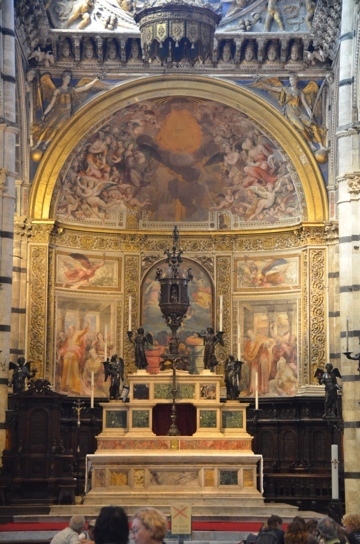 Most of the rooms are completely covered in fresco, and the frescoes celebrate much of life in Siena. One of the rooms is called the Sale Della Pace, or “Room of Peace.” Inside are beautiful frescoes by the artist Lorenzetti, called “Allegory of Good and Bad Government,” and were painted in 1338. I had studied these in advance and was particularly excited to see these in person. The bad government mural is badly damaged, but you can see enough to realize what the artist was trying to say. Bad government, led my devilish men, brings chaos, unhappiness, and destruction in the world. The Good government mural depicts people of all walks of life going about their daily business in a calm and peaceful way. Not only are the murals beautiful, but they also give a lot of insight into political philosophy and everyday life in Siena circa 1340. 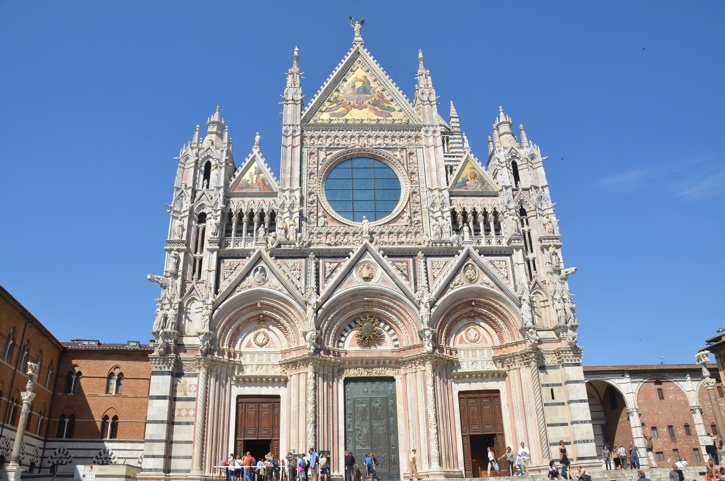 Next, we went to the Siena cathedral. Coming upon this building is actually shocking. You can’t see it because all of the buildings are so tall and close together. You literally walk down the street, turn a corner, and there appears a gargantuan, ornately decorated cathedral which seems to materialize magically. 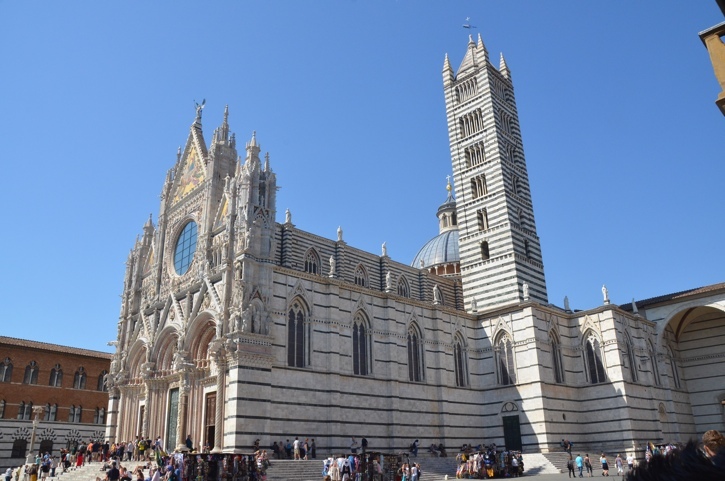 This is the most Gothic cathedral I have seen in Rome, Florence, or any of the smaller towns I have visited. Milan has a lovely Gothic cathedral, but the influence of the Romanesque was felt so much longer in Italy that you don’t really get the Gothic here like you do in France. I thought this cathedral was just stunning. The pulpit was my favorite item. 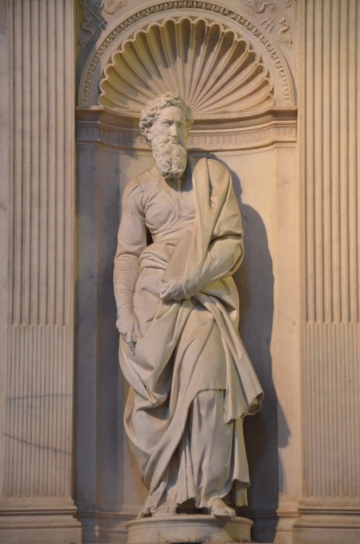 It is completely sculpted out of marble, by Pisano, in 1268. I thought that the figures, bursting with life, energy, and realism, were way ahead of their time. 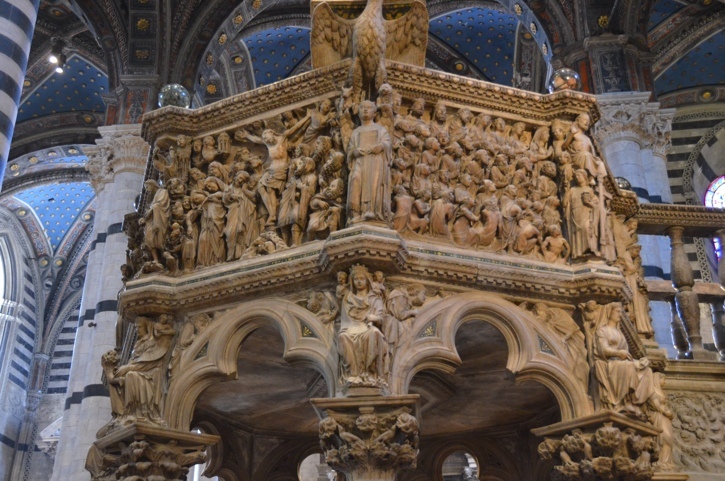 I can’t believe such sculpture was created in 1268! 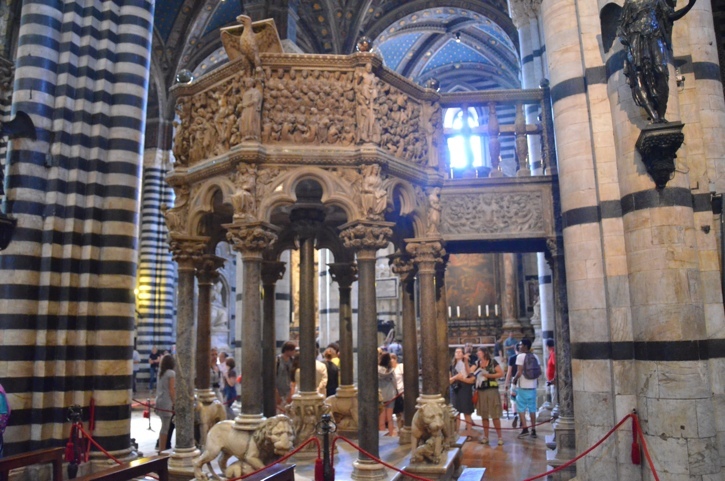 Our last two tourist sites were the baptistery and the cathedral museum, called the Museo Dell’ Opera. 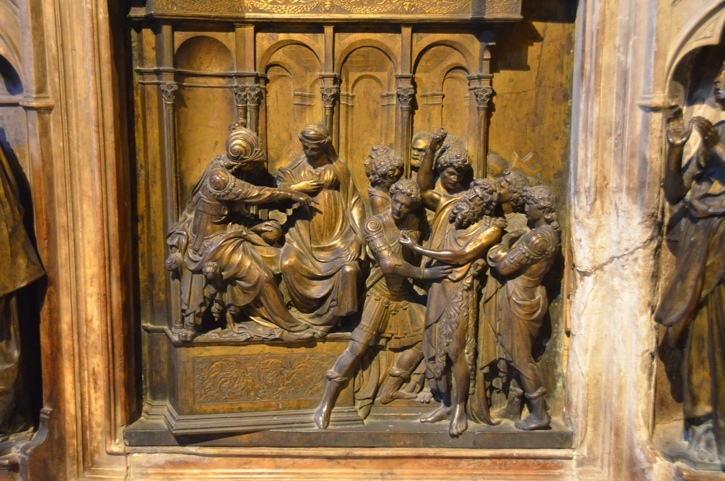 The baptistry font is home to some exquisite bas relief sculpture by Donatello and Ghiberti. The cathedral museum had some real treasuries as well, and was beautifully maintained and lovely to visit. On the top floor of the museum, you can asend to the uppermost structure to enjoy a panorama view of the city. It was quite claustrophobic surroundings in the tiny swirlig staircase, but the view was so very lovely it was worth the climb. Bryce tracked down a bakery that was recommended to us. It is a small, family run operation right inside the city walls. 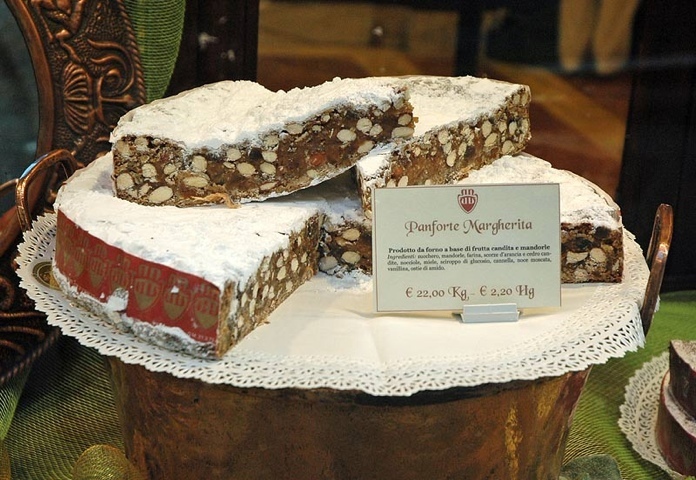 They specialize in Pan forte, a fruitcake famously made in Siena. It is not like fruitcake you might think of. It actually tastes good! This is a chewy, rich concoction of honey, dried fruit, and whole almonds. It has a citrusy taste to it, but it is not bitter at all. I believe I will be purchasing several of these to bring home. 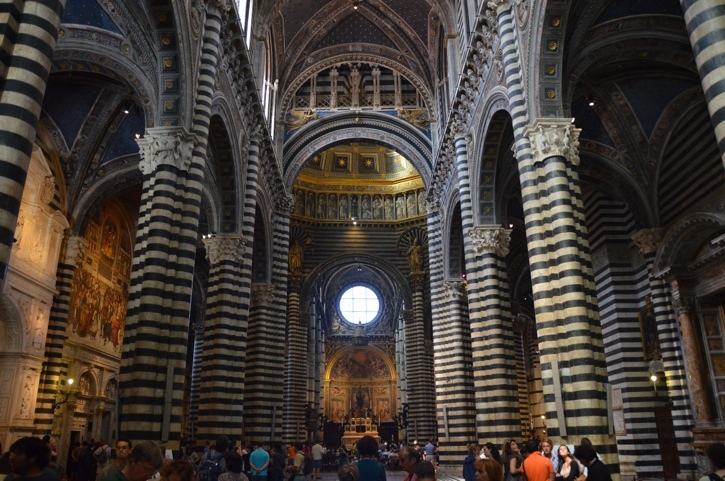 We finished our visit to Siena about six hours after beginning. The trip left us wanting more! It is such a charming place. 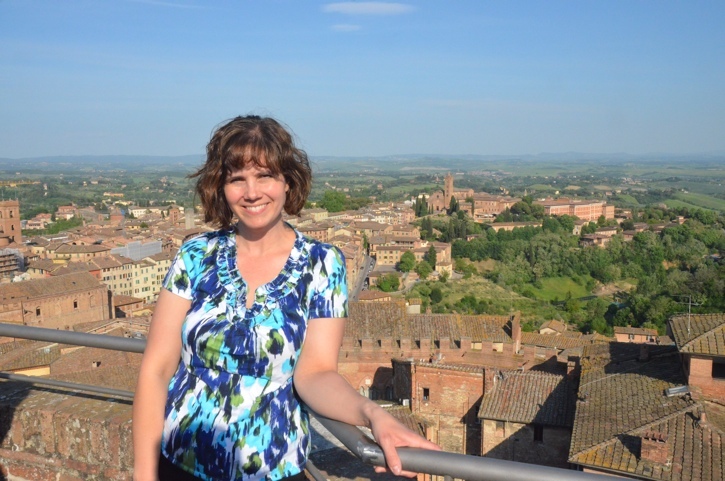 Thanks, Siena, for validating my Romantic imagination. I don’t think I could have imagined you any better. I can tell you are loving this! Sounds like you need to move to Europe for a while. You look super cute in that picture: shirt, hairstyle, everything. I agree, it is always worth a long climb up to see a good look-out. That cathedral is beautiful! Hi! We’re actually heading down to Pisa this weekend, so I’m looking at your blog for ideas of things to do. I’m glad you included all the details. Oh wow! Wish I could meet you there! I want to hear about your trip!